Still looking for ideas as to what to dress up for on Halloween? We’ve gathered the best of the best from the last ten years. Surely, you’ll find some inspirations from these pictures! 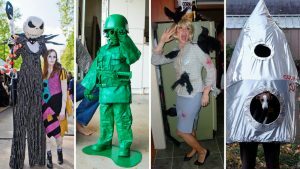 Click here to check out these impressive costumes. MOST INSPIRATIONAL POST-GAME SPEECH EVER? © 2017 Bristol Broadcasting Company, Inc. All Rights Reserved.